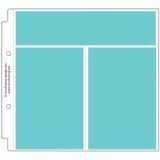 Doodlebug Page Protectors 8"X8" 12/Pkg - DOODLEBUG-Storybook Album Page Protectors. This package contains twelve page protectors for use in 8x8 inch Doodlebug Storybook Albums. All are divided into three pockets per page-- two pockets measure 6x4 inches and one measures 2x8-1/4 inches. All pages are made using high-quality materials that won't yellow with age or stick to photos. Acid and PVC free, archival quality. Storybook Album not included. Imported.